The 2014 UBC Student Housing Demand Study has finally been released. It is a survey of students living both on- and off-campus about their satisfaction levels on many aspects of their living situation: location, price, roommates, safety, quality, amenities, etc. It is a sequel to a UBC Student Housing Demand Study from 2009/2010 and contains a lot of comparisons to the earlier data. The report is 163 pages, so needless to say there is a ton of stuff in there, but since the issue of housing affordability on campus is a perpetual issue which has risen to the surface recently, it’s worth going over some of what the report has to say on that topic. The preference for student housing at UBC seems to comes down solely to that age-old real estate maxim: location, location, location. When students living on-campus were asked “What factors contributed to your decision to live in on‐campus accommodation this year?” the top three answers were Convenience (79.1%), No Commute (66.9%) followed by Ease and certainty around housing situation (49.9%). Bringing up the rear were Affordability (20.9%) and Quality of accommodations (17.1%). On the other side of that coin, when students living off-campus in the private market were asked “Did any of these factors influence your decision to live off campus rather than in an on‐campus student residence?” the number 1 answer was Price/Affordability (59.3%). The perception among students who took part in this survey is that “below market” student residence is actually less affordable than the larger housing market. The data presented in this survey seem to support this notion as well. This map of self-reported rents, clustered into zones, is included in the report. (Ignore the rent figure for “traditional residence”. The only off-campus comparators to traditional residence – no kitchen and communal washrooms – are SROs. Almost everyone off-campus is living apartment-style.) The average price of an apartment-style room in residence is $788. 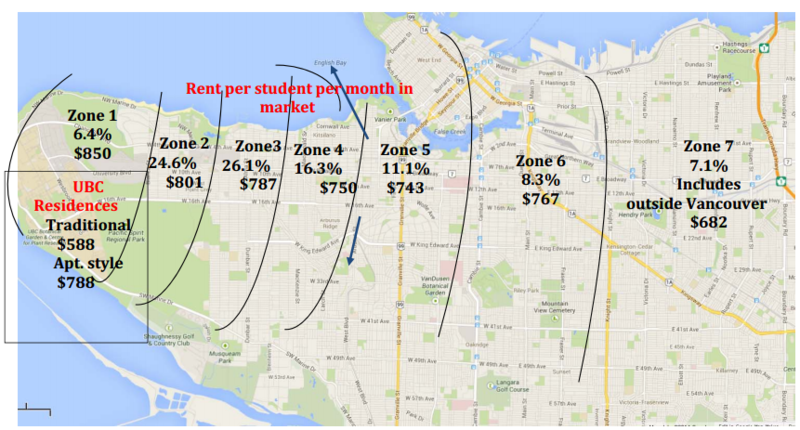 That is on par with, not below, the average rent students pay to live in Kitsilano, $787. Move further east, and it continues to get more affordable. Apartment-style living at UBC is only "below-market" in the UBC market, not in the context of the rest of the region. UBC would have you believe that an hour-plus commute from a far-flung suburb is necessary to find rent on par with the “below market” rental rates offered by student residence. In short:  – the evidence in this survey simply doesn’t support that claim.